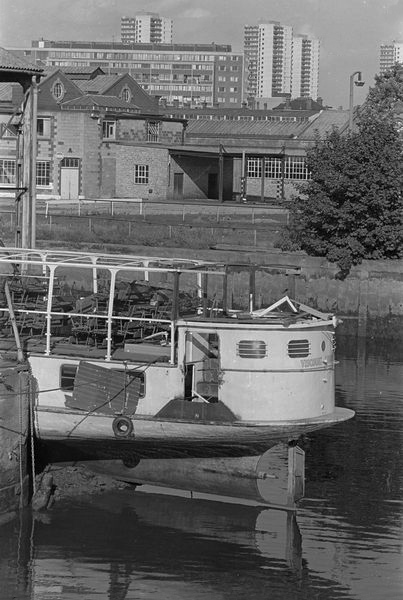 They continued to expand and buy up neighbouring wharves, eventually owning an around 1,000 ft stretch of the riverside, erecting more buildings on the expanded site. The building in my picture is I think their large factory building from 1934-7. 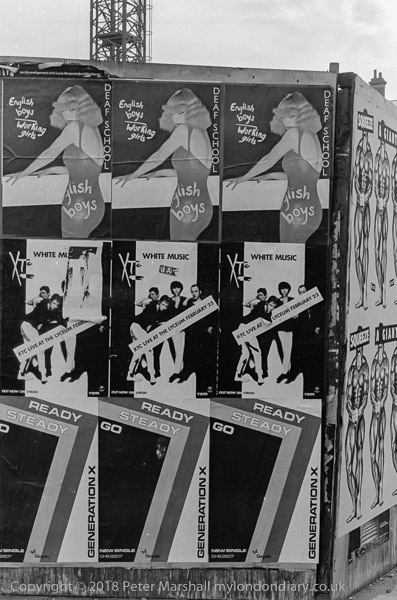 By the 1960s the business had run out of space for further expansion and moved production to sites in Worcestershire and Swansea. 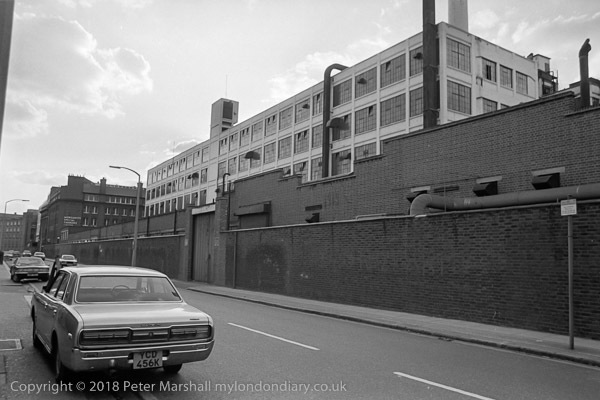 The Battersea Works closed in 1970 and building of a housing estate on the site, Morgan’s Walk by Wates Ltd, began shortly after I took this picture and was completed in 1984. 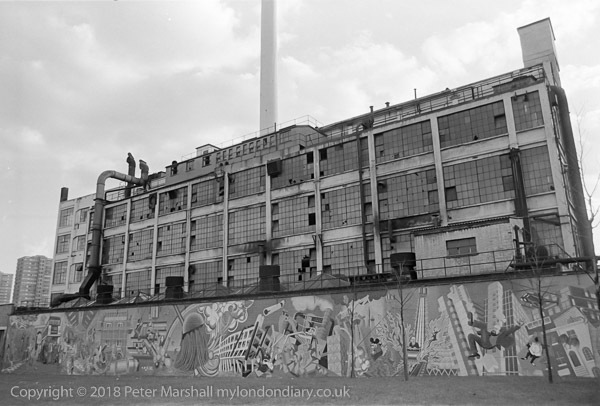 ‘The Battersea Mural: The Good, The Bad and the Ugly’ on ‘Morgan’s Wall’ was designed by Brian Barnes in 1976 and painted with permission from Morgans by him and 60 local residents from the Battersea Redevelopment Action Group, taking nearly 2 years to complete. 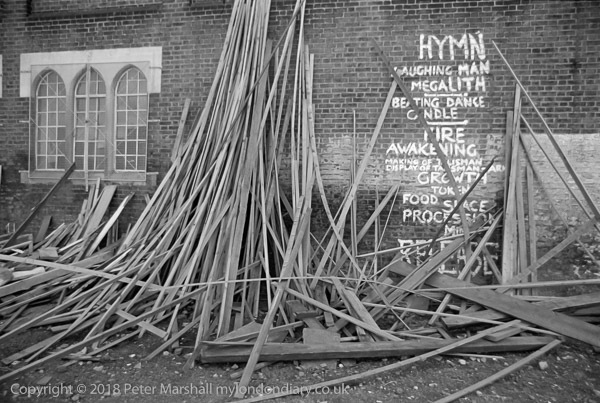 Scandalously an application to make the retention of the wall a condition of planning permission for demolition of the site was turned down and the 276-foot wide mural between 12 and 18 ft high was demolished when the Morgan Crucible Company brought in heavy plant at dead of night on 6th June 1979. The artist and six others were arrested at the site later in the day. 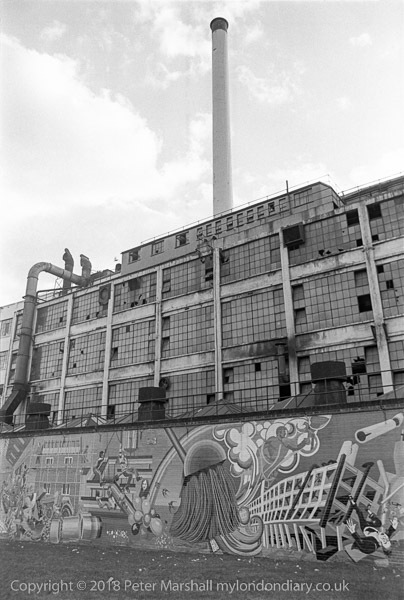 Fortunately the mural, a vision of the future of the area, had been well recorded in photographs and on film, which you can see on YouTube. A portrait format image showing the full height of the chimney. A long section of the wall along Church St to the west of the mural. At the end is a building with a notice stating it is Morganite Special Carbons Limited. Morgan Advanced Materials plc is now a global engineering company with its HQ in Windsor and operating in 50 countries, manufacturing at around 85 plants in over 30 countries and selling to customers in more than a hundred. 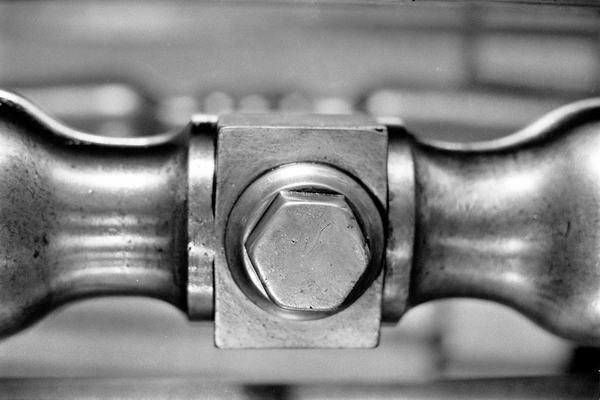 It describes itself as “a world-leader in advanced materials science and engineering of ceramics, carbon and composites”, making “insulating fibres, electrical carbon systems, seals and bearings, ceramic cores, crucibles for metals processing and high technology composites” as well as specialist materials “to perform critical duties in harsh or demanding environments” in “healthcare, petrochemicals, transport, electronics, energy, security and industrial” markets. 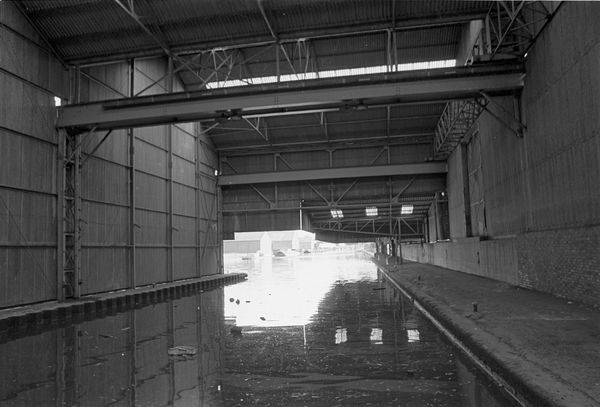 The view upstream shows an industrial scene that has now disappeared. 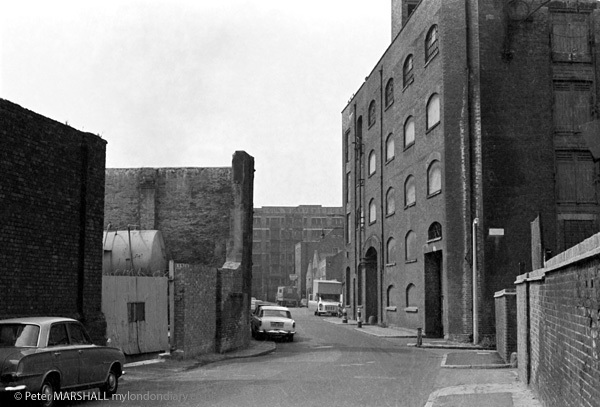 At left is Rank’s Hovis Battersea Flourmill. The first mill on this site, built by Thomas Fowler in 1788 was apparently a rather curious horizontal windmill to a design by a former naval captain, Stephen Hooper. Fowler used it for grinding linseed to give linseed oil, but it was soon taken over and used to grind corn and a Boulton & Watt steam engine bought to replace or augment the wind. 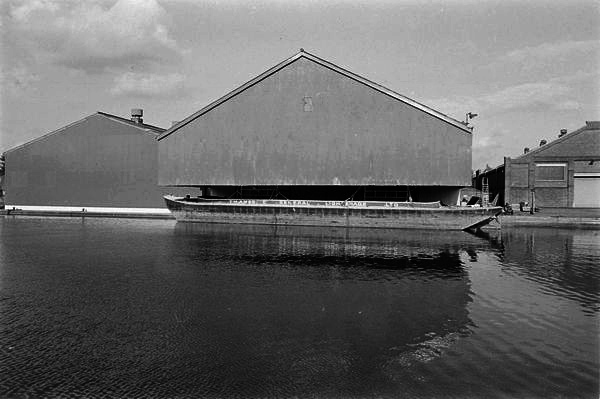 The mill was replaced by a new mill using steel rollers rather than millstones by Mayhew & Sons in 1887, and the business was acquired by Joseph Rank, Hull’s great miller, in 1914. He kept the Mayhew name and put his son Rowland in charge to try out new ideas in milling. Rowland’s first move was to bring in the architects of Hull’s greatest mills, Sir Alfred Gelder and Llewellyn Kitchen to provide modern mill buildings including some on land reclaimed from the river. 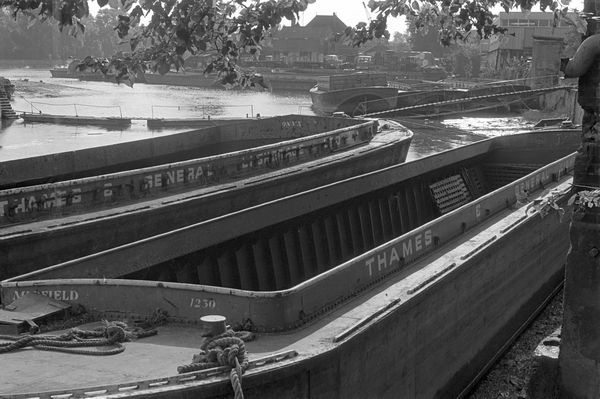 They made various later additions to the site, fighting to build silos taller than were allowed under the London building regulations so that a whole barge of grain could be unloaded without stopping. After Rowland died in 1939, the mill became part of Rank’s who became Rank Hovis McDougall Ltd in 1962. 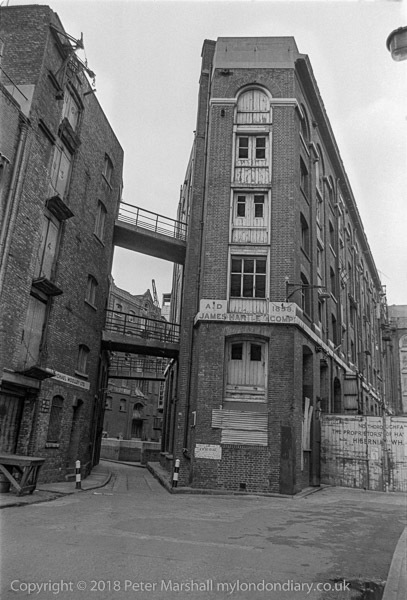 The mill closed in 1992 and was demolished in 1997. The tall triangle of Richard Rogers’ Montevetro (‘glass mountain’) now occupies the site. On the other side of the river, which is crossed by the Battersea Rail Bridge, is Fulham power station, with its 4 chimneys in line. 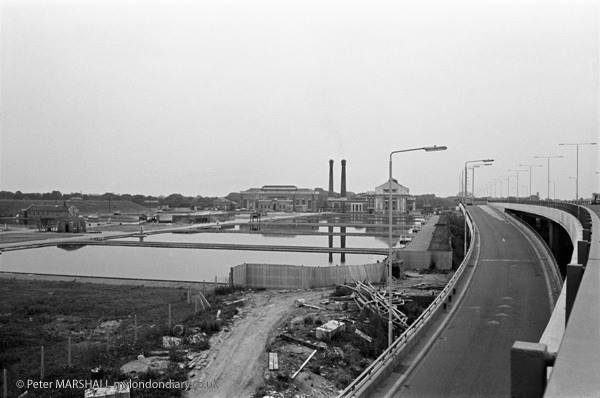 Built for Fulham Borough COuncil and opened in 1936, it was the largest municipal power station in the country and had its own fleet of colliers to bring coal from the Tyne. 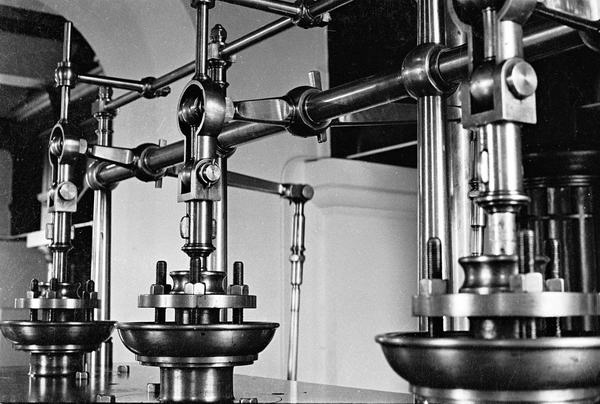 It was also one of the first power stations to have flue-gas desulphurisation equipment, although this was removed around 1940. Nationalised in 1948 the power station was decommissioned in 1978 and demolished in the 1980s. 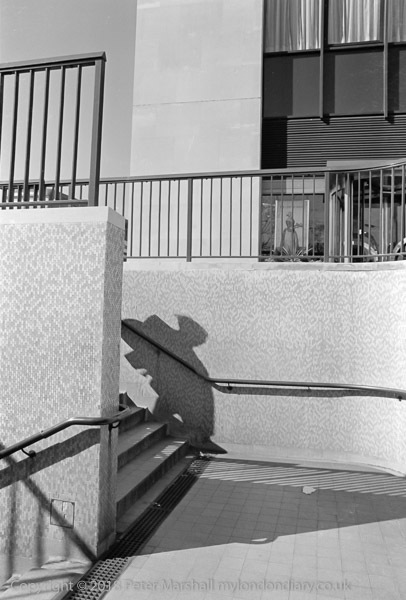 Another preoccupation at the time was my interest in shadows, such as this one apparently descending the Hyde Park corner subway at the lower end of Park Lane. Like my interest in reflections, this was at least in part inspired by my interest in the work of Lee Friedlander, whose work I had been introduced to by Creative Camera magazine. I ordered a copy of his self-published book ‘Photographs’ (the second from his Haywire Press after his 1970 Self Portrait) when it came out at about the time I took this picture, though it took some time for the Creative Camera bookshop to actually get a copy for me. Self Portrait had been full of shadows, perhaps the earliest and most inventive book of ‘selfies’, but seemed then (and later when I got a review copy of the 1998 second edition) to rather stretch a single idea too far. ‘Photographs’ a few years later was a early career retrospective and still in my opinion contains his best work. 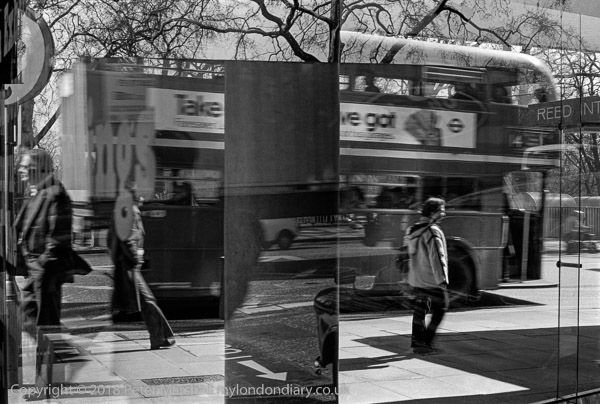 and I think involves two reflecting glass surfaces, one possibly a bus shelter. The trees are presumably in Green Park and I think this must have been made somewhere on the north side of Piccadilly between Half Moon St and Bolton St.
‘Carrington Mews Dwellings’ were, as it says above the door, ‘Erected A.D. 1877 by the Metropolitan Association for Improving the Dwellings of the Industrious Classes’. Carrington Mews is now simply the part of Shepherd St west of Hertford St and this building was demolished soon after I took this picture. Its place is I think now occupied by May Fayre House, some kind of hotel apartments. MAIDIC was “a well-intentioned philanthropic organisation” which had developed into “a major provider of housing” by the time this block was built. It was the first of its kind, founded in 1841 to provide to provide affordable housing for the working classes on a privately run basis, with a financial return for investors based on the ‘five percent philanthropy’ model (for MAIDIC this was specified as a minimum return.) It gained a Royal Charter on 30th June 1845 and was incorporated as a Royal Charter Company as The Metropolitan Property Association in 1981. It has no connection with the similarly named Metropolitan Housing Association. The setting up of the association followed the work of Edwin Chadwick whose ‘Report on The Sanitary Condition of the Labouring Population of Great Britain’ was begun in 1839 and published in 1842 and predated the publication of Engels’ ‘The Condition of the Working Class in England’ in 1844. Companies such as MAIDIC (and there were around 28 of them in 1875) increasingly found it difficult to make a sufficient financial return, and were largely superceded by organisations with a more charitable basis and the growth of large-scale municipal housing from the start of the 20th century. 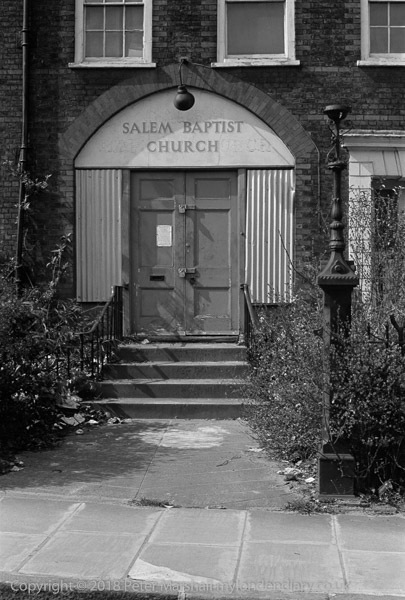 My first thoughts on seeing the doorway of the then disused Salem Baptist Church on Richmond Green were undoubtedly about the Salem Witch trials in Massachusetts in 1692/3 which were the subject of Arthur Miller’s powerful play The Crucible. It gave Salem, which in the Old Testament was the home of Melchizedek king of Salem who was the priest of the most high God and provided bread and wine to bless Abraham after his victory against the kings, a bad name. Salem was the name of the god who was worshipped in that city and comes from the same Hebrew root as ‘shalom’ which means peace and wholeness, and the city of Salem became better known as Jerusalem, the added ‘yeru’ meaning a foundation stone. Salem became a popular name for Christian, particularly puritan churches who were averse to naming their churches after saints, and there are many Salem churches and related organisations, particularly in the USA, and there was even a Battle of Salem Church in Virginia during the US Civil War. The congregation that worshipped in Richmond, Surrey’s Salem Baptist church was founded in 1861 and after over a hundred years moved out some time before I took this picture to smaller but more modern premises a mile or so away in Kew, where they continue under their new name of Kew Baptist Church. 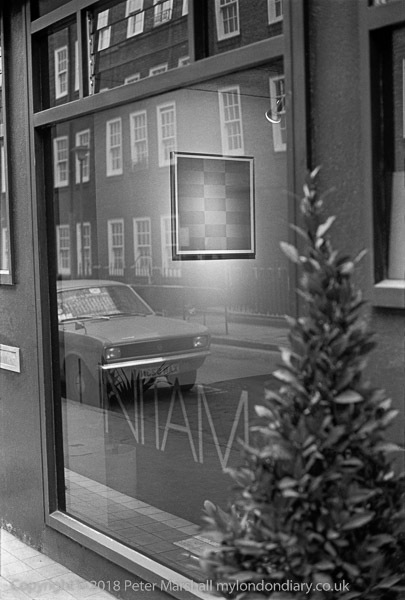 One of several images from a walk through Pimlico, few of which I am able to locate precisely. But I think that this shop, which I had my back to was possibly in Denbigh Place, where a short row of houses, now all with smart black front doors, shares this rather unusual fenestration, though there are some differences, and it could be another block by the same builder/architect. The houses, like that I was photographing the window of have been rather done up and with some alterations, including metal fences to make those wide shelves under the upper windows into false balconies. The area was originally laid out by Thomas Cubitt for Richard Grosvenor, 2nd Marquess of Westminster from around 1825, and some parts of the area when I walked through it were distinctly down-at-heel, with large houses in multiple occupation. Many were like these were being given a face-lift in the 1970s and 80s, and property prices around here are now of course astronomical. 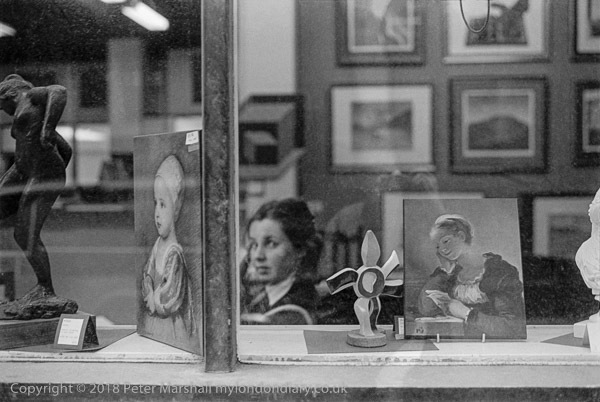 I had for some years been intrigued by reflections and taken many photographs with them, perhaps encouraged in particular by a number of pictures by Lee Friedlander. Few of them hold a great deal of interest for me now, though sometimes others seem to like them. 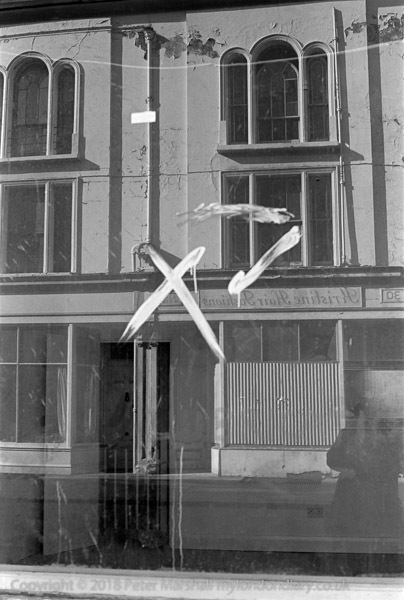 Here the white-washed cross and tick form a separate layer on top of what seems at first glance simply a not very clear view of the front of a house. 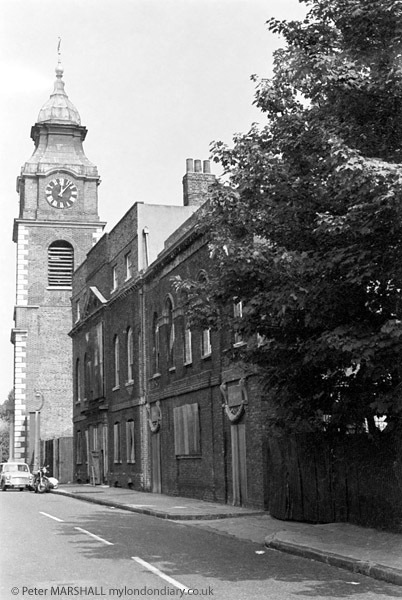 The Iglesia Ni Cristo was on a main road in Battersea and close to a railway bridge, probably on Latchmere Rd, but there seems to be no trace of this building now and I think it has been demolished. 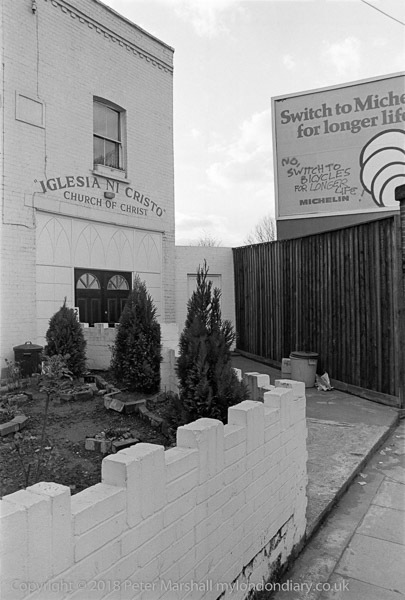 The Iglesia Ni Cristo formed its first European congregation in a house – not I think this one – on the Latchmere Rd in 1975 and now has a large modern building not far away in Parkgate Rd. The church was founded in the Phillipines in 1914 by Felix Y Manalo and claims to be the one true church, recreating the original vision of the church founded by Jesus. It is a unitarian church, believing in the one true God and rejecting the divinity of Jesus, who it believes is the ‘Son of God’ and God’s highest creation. I connected the addition to the billboard’s ‘Switch to Michelin poster’, ‘No, switch to Bicycles for Longer Life!’ not just with that poster but also with the Church of Christ and its promise of life everlasting. 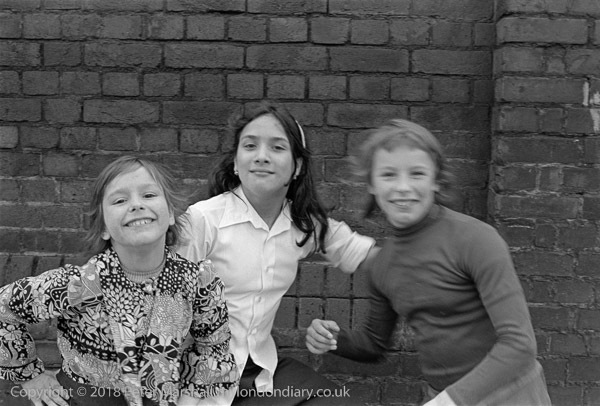 These three girls saw me with my cameras taking pictures – somewhere in Battersea, perhaps at Latchmere House, a small block of council flats at the corner of Abercombie St and demanded that I take their picture. But they were hyperactive and although I took two frames, at least one is moving on both. I’m not too good at guessing ages, but I think they would now be around 50. 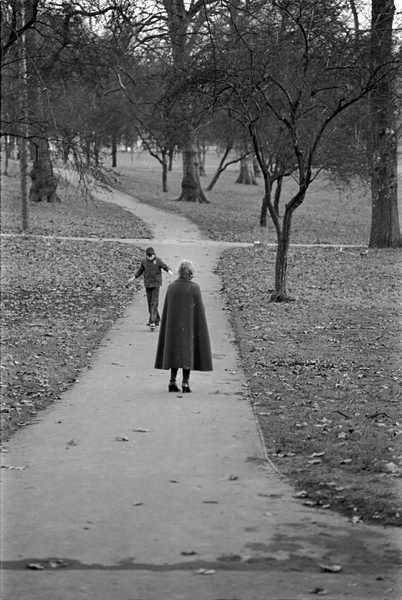 I often wondered when I took pictures like this – it was usually easier to do so than to refuse – why they wanted me to take their pictures when they would never get to see them. Often they thought I was ‘from the papers’ and they wanted their small piece of fame, though I always denied being a press photographer. I think this is probably the first time that I’ve published this picture and I wonder if any of the three will see it. Latchmere House on the corner of Abercrombie Street was a small block of eighteen flats built by Battersea Borough Council in 1927. 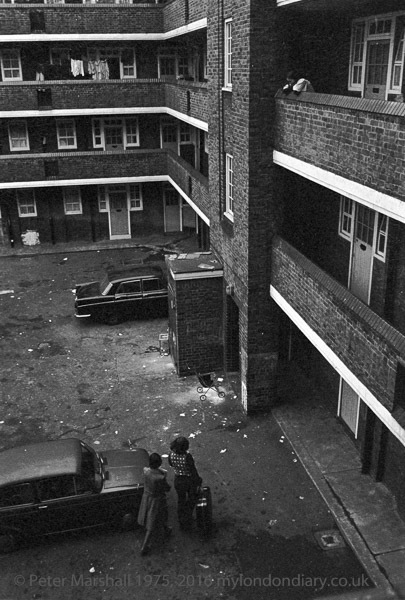 This was an age where local councils were proud to build houses for local people, and realising that many lived in poor quality and over crowded privately rented properties they built homes to a good standard for the time, both large housing estates mainly on the edges of their boroughs for those who could afford slightly higher rents and the cost of travel to work, and also blocks of flats such as this in the middle of their boroughs for those who could not afford council house rents and travel costs. Things are rather different now, with councils long constrained by government from serious building programmes, and looking at their estates not as housing but as development opportunities, assets to be realised by working with private developers (including some housing associations that appear to have lost track of why they were created) to build homes for the wealthy, often just as investments rather than places to live, forcing former residents to move out of London. 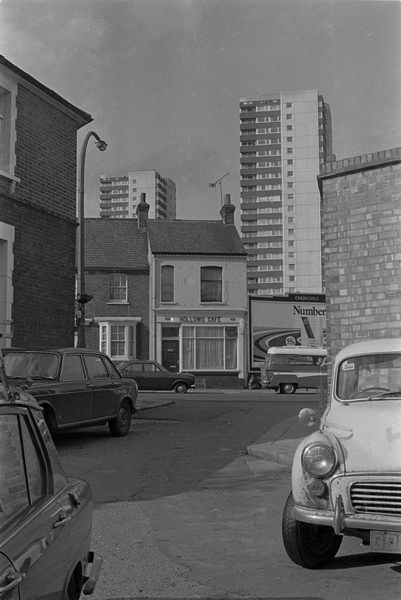 This was a small block of less than 20 flats and was demolished some years ago. 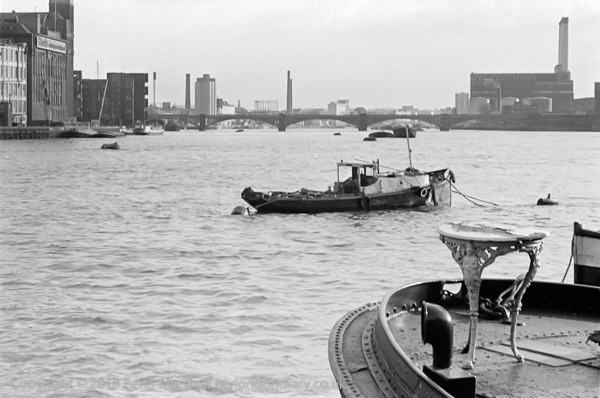 In this view from Battersea Bridge looking upstream two towers of the World’s End Estate and the chimneys of Lots Road Power station, then supplying power for the Underground, are clearly visible. THis site is now being redeveloped to plans by Terry Farrell as Chelsea Waterfront. 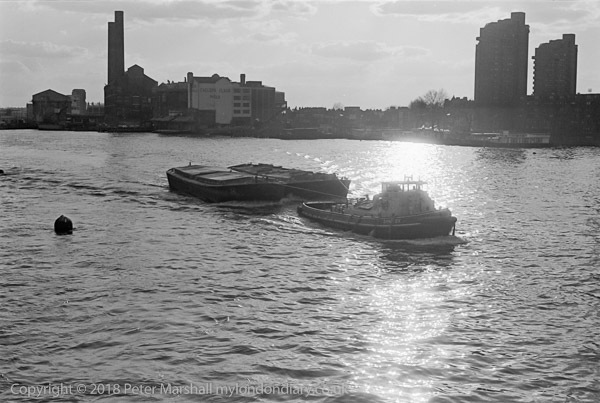 The lighter building to the right of the chimneys is the Chelsea Flour Mill, parts of which has been demolished thou some warehouses hardly visible in this image beyond remain as a part of Chelsea Wharf, a mixed development on Lots Rd. To the left of the power station there is a view of a gasholder at Sands End. None of the other buildings remain and the area around Chelsea Basin is now Chelsea Harbour, with the reduced size basin becoming a marina for the owners of the luxury flats and hotel residents around it. Planning permission for the ‘millionaires’ Toytown’ was granted and work began there in 1986 and it provided a memorable locale for J G Ballard’s 2003 novel ‘Millennium People’. The design for the World’s End tower blocks was commissioned by the Metropolitan Borough of Chelsea from Eric Lyons in 1963, but work only began, then under the Royal Borough of Kensington and Chelsea, in 1969 with the first residents only moving into the blocks in 1972, and the estate was only completed the year before I made this picture. 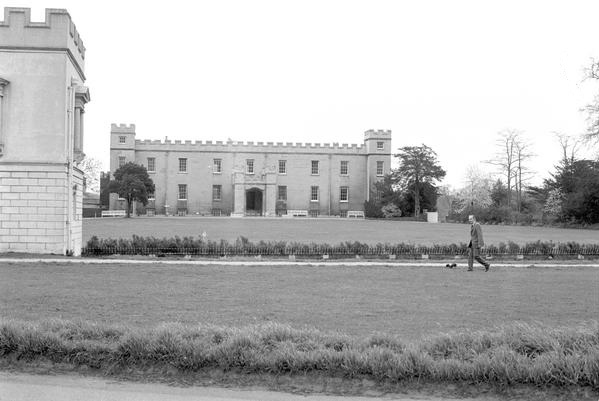 The design of this ‘village style living in the heart of London’ was for a density of 250 people per acre, almost double the LCC’s limit; the council argued this was needed to rehouse those who would be moved out of the 11 acre site of closely packed Victorian housing, and their appeal was allowed. The 7 towers are linked by low rise blocks with walkways in a plan of two rectangles with towers at all but one corner, which links to the corner of a second rectangle by a low block; the towers and low rise links contain a roughly equal number of the 750 homes. The only one of my grandparents I remember was a small elderly woman dressed in black with very strict rules, particularly on Sundays, when we were not allowed to play but had to read improving books. She sat in the corner by the fire, where a smoke-blackened kettle always stood. She didn’t say much and didn’t like children to make much noise either. At Christmas we would all get together for a family meal around a large table in the front room, seldom used for the rest of the year, where all except me would eat goose, sent up from the family farm by train to Paddington where one of my uncles would go to collect it the day before. I found goose far to greasy and instead gorged on the chipolatas and bacon from the local butcher. My grandmother had been born Eliza Ann Davies in Llansaintfread in mid-Wales on Boxing Day in 1865, so the Christmas meal was a joint celebration. 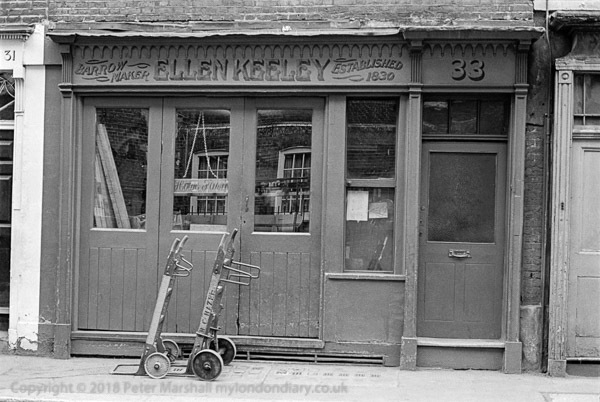 She had met my grandfather who came from Essex but moved to London to work when she, like many young Welsh girls had also come up to work in London, perhaps in a shop like this, perhaps the family dairy shop, somewhere long gone on the Gray’s Inn Road. 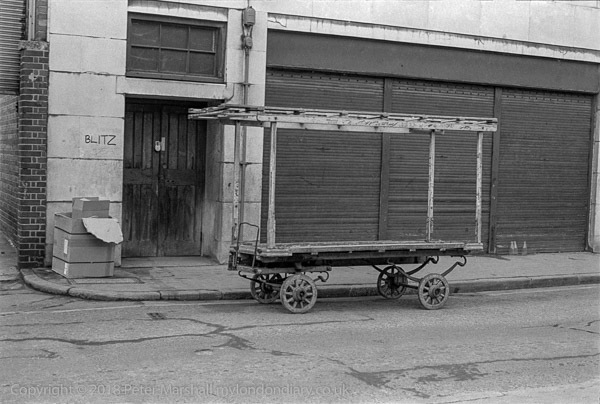 London dairies would sell produce sent from Wales by train, but also might have a cow or two kept in the back yard. Not far away there is still the London Welsh Centre (“The world’s only Welsh cultural centre”, though it only opened there in 1937) and the 1854 Welsh Tabernacle (Eglwys y Tabernaacl) Grade II listed and still standing, though now Ethiopian rather than Welsh. 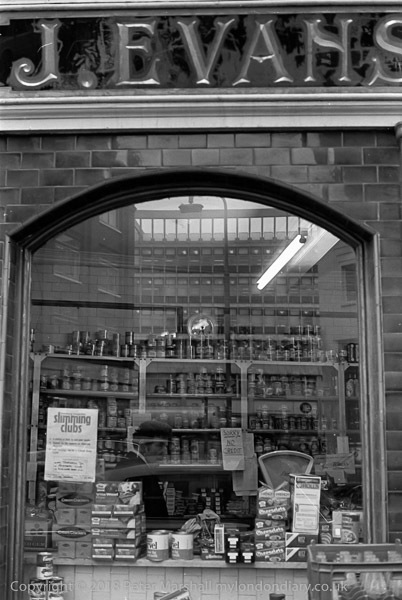 The shop in the picture, J Evans, on the corner of Conway St and Warren St is Grade II listed and was built around 1793, though the shop front dates from around 1916, when J Evans, dairyman, is recorded as having arrived here, presumably with a cow or two. It was more a small general store when I took this picture (along with others, mainly in colour which show up the beautiful blue of the tiles and surrounding the gold lettering) and is now the Old Diary coffee shop. 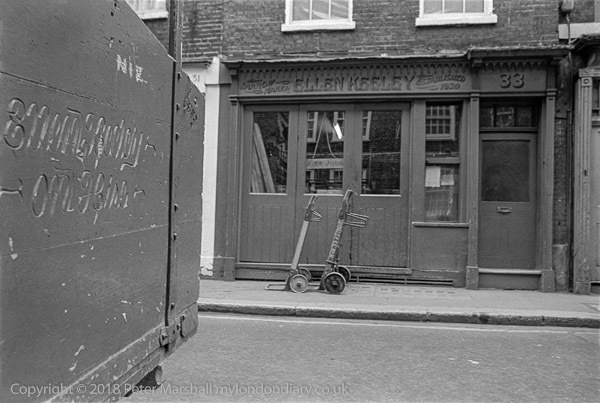 Key House on Bowling Green St, not far from the Oval was where friends we often visited lived in a shared flat. It was one of Lambeth Council’s hard to let properties that were advertised and eligible local residents and workers could queue to get, an overnight vigil to be near enough to the front of the queue. 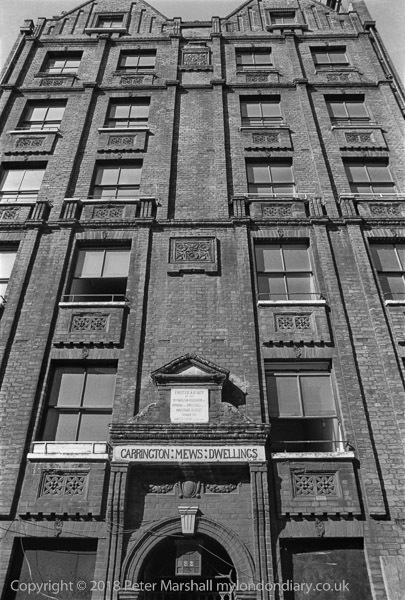 Built around 1930, when both the London County Council and the Metropolitan Borough of Lambeth where building large blocks in the area to provide low cost accommodation for the working class poor. 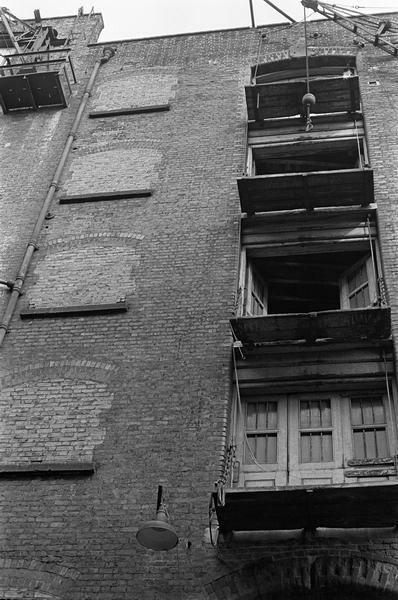 The rent for their 3-bed flat would probably have been around 12 shillings (60p) a week. The flats were built to relatively high standards, providing some of those moving into them when new for the first time with a scullery, bathroom and toilet in their home. The rooms too were rather larger than in many of the ‘luxury’ flats now being built, and similar flats in this block have sold recently for over £400,000. Some things were of course not up to modern standards, particularly the single-glazed draughty windows, and central heating was at that time unknown. Living rooms had a coal fire and bedrooms were usually unheated, though they might have had fireplaces. But the flats they were solidly built, with brick walls that provided better insulation than many postwar system built flats. 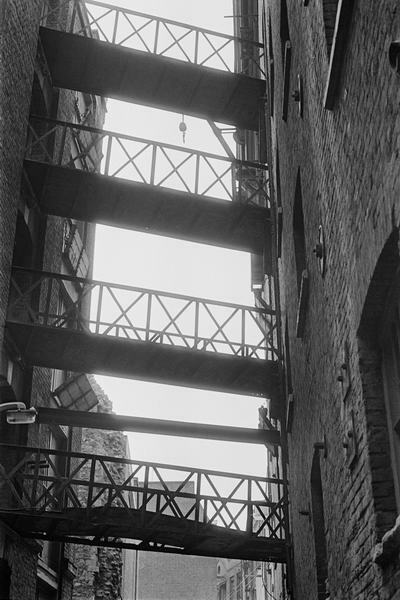 What let them down over the years was maintenance and the cleaning of the communal areas – the balconies, laundry rooms, stair cases, rubbish chutes and courtyards. 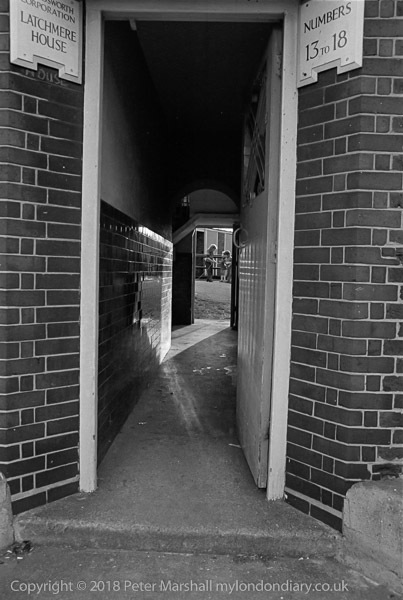 The council made some attempt to improve them in the 80s and 90s, fitting doors at the entrance to the stairs, but many residents found these a nuisance and some locks were broken and other doors wedged permanently open in the years until all our friends moved out. If one stair was locked you could usually find another open and walk around on the balcony. 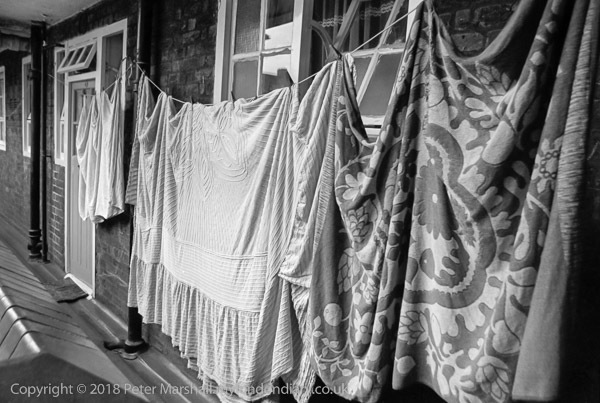 There were still communal laundry rooms, and still a mangle in the one next to our friend’s flat, but most people by then had some kind of washing machine in their own flats, but they still hung their washing out along the balconies. Everything coming into the flats had to come in up the stairs, and there were five floors; fortunately my friends were only on the second but helping to get a piano up the two flights to store in the laundry room left me with painful back for several weeks. 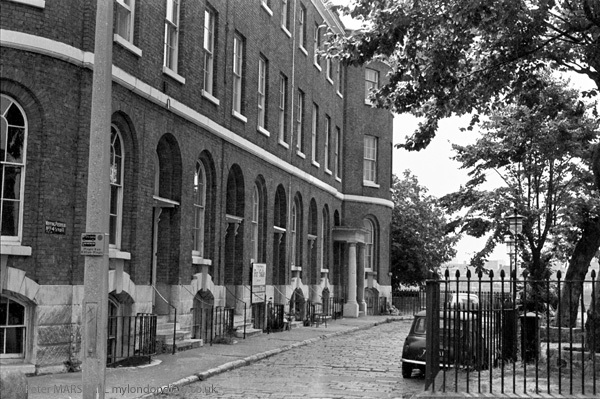 The building at the City farm was some kind of former school at the back of St Peter’s Church which included the 1861 Lambeth School of Art. We organised some meeting in this building to which almost nobody came and there was no heating on a desperately cold winter day and we froze even in our outside coats. The church, Grade II* listed and consecrated in 1864 though its tower was never built, and the city farm are both on the site of Vauxhall Gardens, a notorious Georgian pleasure ground where great festivals took place, along with many amorous encounters in the darker wooded corners; the church itself was on the site which once had a Moorish tower built as a firework platform in 1823 which burnt down 14 years later and a dimly lit ‘Lovers Walk’, and the art school on St Oswald’s Place on the site of the Vauxhall Garden’s famous Neptune Fountain, his marine chariot drawn by five horses from whose nostrils water, steam and even flames would emerge. Once I went to a service in the church, whose magnificent interior is well worth a visit and there are regular concerts there. We went to a service there, a small group of people on chairs in the middle of a large building, led by a young priest in black leathers. 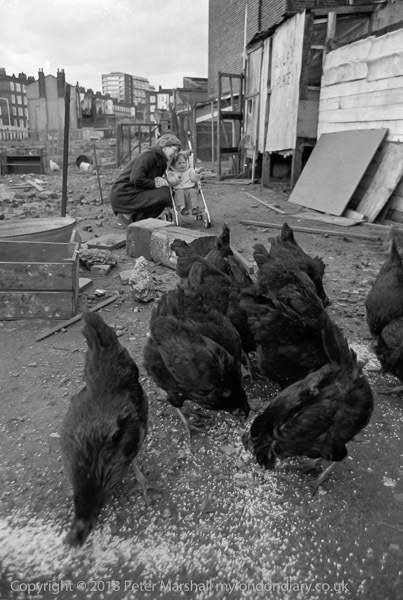 Another picture from Vauxhall City Farm, this time a chicken’s eye view of my wife and son looking at them. Good to have the houses and flats in the background which shows clearly this is a city farm. 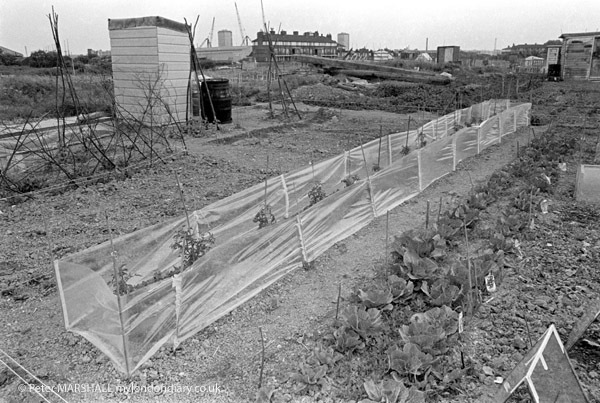 This was not long after the farm was founded in 1976 as Jubilee City Farm by a group who were squatting in St Ostwald’s Place. The farm is still going in Tyers Place, but unrecognisable from those early days when it was run on a shoe-string by a few local enthusiasts and volunteers. 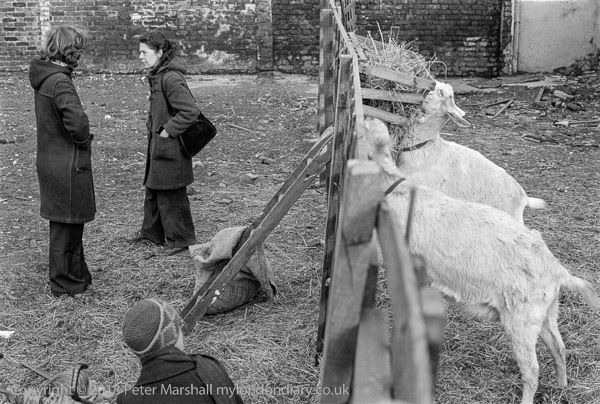 A group of our friends lived in a council flat in Key House in Kennington and we went with them to Vauxhall City Farm, which one of them was very involved in, and I’ve put several pictures from the visit on-line. Usually I like – other things being equal – to work from a normal eye level, it fitting in with my ideas about a naturalistic approach to the medium. Its the viewpoint from which we mainly see things. And these days if I climb up on anything I’m likely to get the shakes, while if I get low down its sometimes rather an effort to get up. I suspect I took this picture from a ladder rather like the one in the picture, presumable there to allow those looking after the goats to easily access their enclosure. Though there isn’t one on the other side to allow them to get out, perhaps because the goats might take advantage of it. At bottom left you can see the head of my wife and our then two-year old son in a buggy looking at the goats, and the two women were I think both among our visiting party. The fence wasn’t quite dividing the sheep from the goats, but this did come into my mind and still does whenever I see this picture. 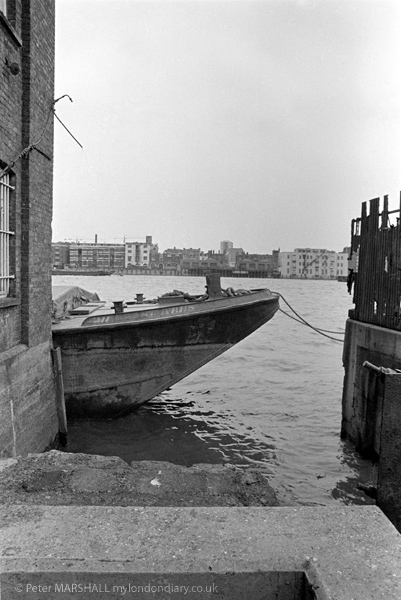 This time I am sure where the picture was taken, as the background building has a name on it, which is St Mary Overy’s Wharf and in front of it is the wall at the end of the dock. 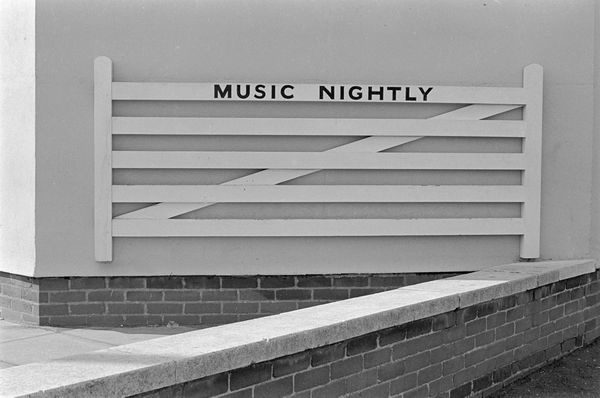 The building at left is Rosing’s Wharf, and at the right is a part of the sign on West Kent Warehouses. The next frame makes this even clearer, taken from a similar position but with a wider lens it shows the whole sign, AD 1858 James Hartley & Compy. Messrs. Rosing Brothers & Co., coffee cleaners and merchants took over the building and renamed West Kent Mill in 1891. 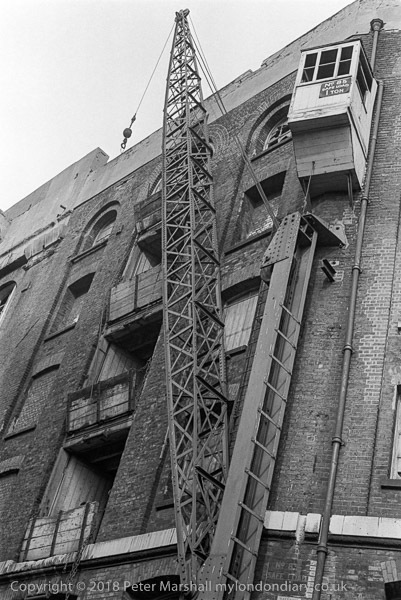 Rosing’s Wharf has the name Michael Wooley Ltd, and a sign on the wall gives the safe working limit for the hoist to the upper floors of 15 cwts – 15 hundredweights or three-quarters of a ton. 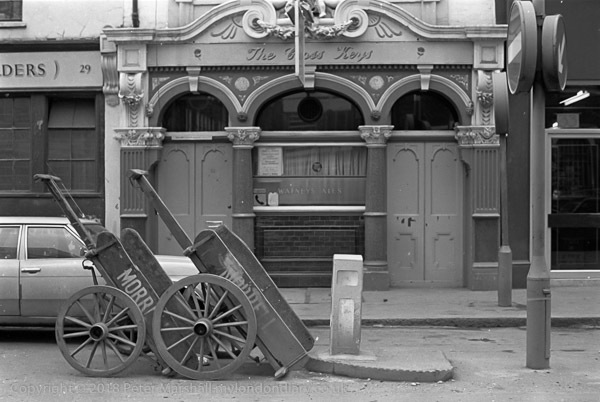 Wooley was a wine importer and the building was still in use until 1979, the year after I photographed it. Rosings took over this building in 1890. It had been built around 50 years earlier and used for storage of various foodstuffs and for feathers, and, from 1872 for Danish bacon, butter and cheese. 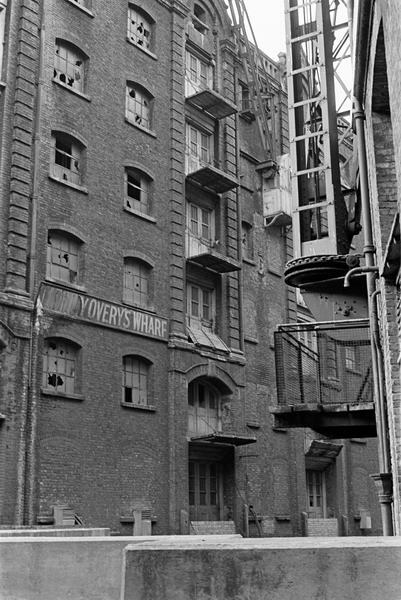 The premises were taken over by the Proprietors of Hay’s Wharf in 1921 and used by them until 1964. 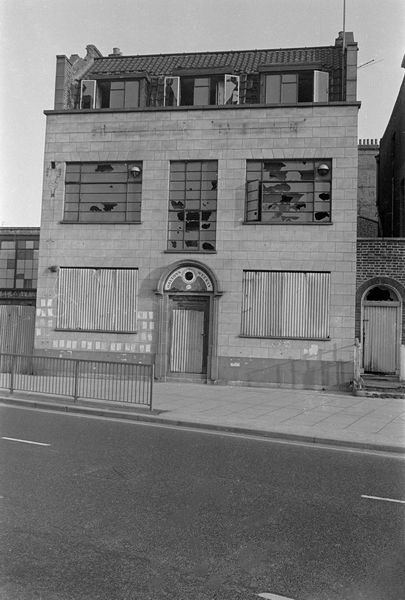 Michael Wooley Ltd moved in, putting in new offices and toilets in 1967 and the building was demolished in 1983. 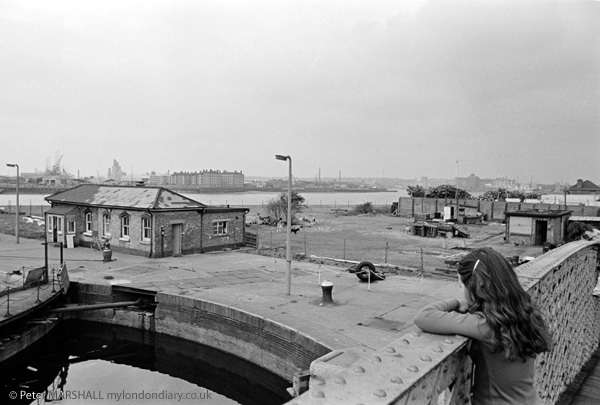 Although called wharves, buildings such as Rosing’s Wharf had no direct river access. 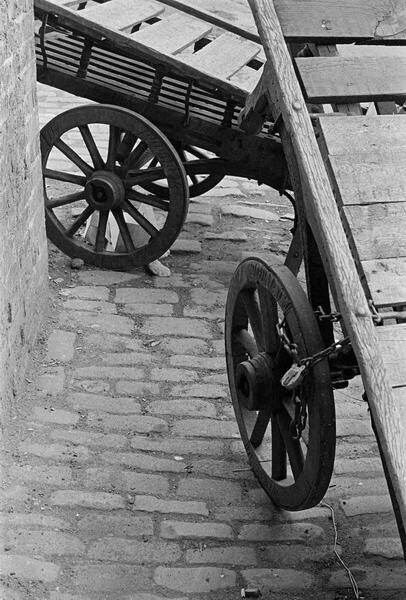 Goods would be landed from lighters at nearby wharves or docks – such at the St Mary Overy Dock a few yards away – and then brought by cart or lorry for storage. The concrete wall visible here in the foreground (and further back in the above images) is the dock wall for the dock which now holds the replica Golden Hind. Like other walls along this part of the Thames it was raised at this time to help prevent flooding. 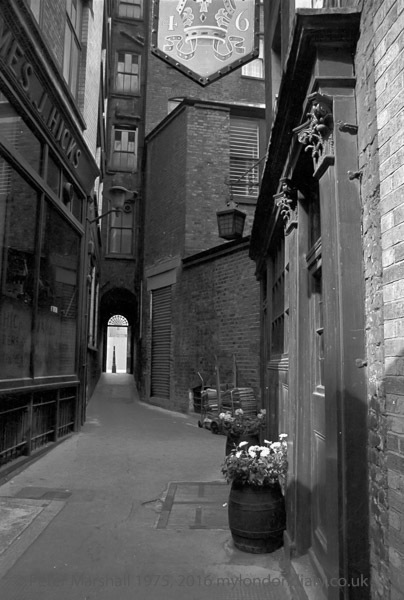 There was an area of small alleys and streets close to Southwark Cathedral which I wandered around, and it is hard to know precisely where this photograph was taken. 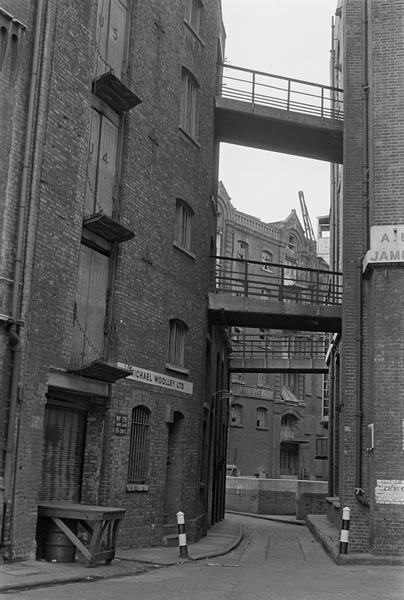 There were overhead bridges between a number of the warehouses in this area, including Rosings’ Wharf and Stave Wharf, Stave Wharf and West Kent Wharf and West Kent Wharf and Hibernia Wharf, as well as between the buildings of Hibernia Wharf on either side of Montague Close. Hibernia Wharf was a large complex of buildings in Montague Close, between West Kent Wharf which was on the east side of St Mary Overy’s Wharf and the ‘new’ London Bridge. These buildings in the Pool of London were all latterly owned by the Proprietors of Hay’s Wharf, further downstream. Only St Mary Overy’s Wharf had direct water access with lighters coming into the dock which is still there, and goods were taken to the various nearby warehouses either along the narrow streets or by bridges between buildings such as these. Most of the goods handled here were foodstuffs and other low value items. West Kent Warehouses were rebuilt by the wharfingers J. Hartley & Co in 1858. 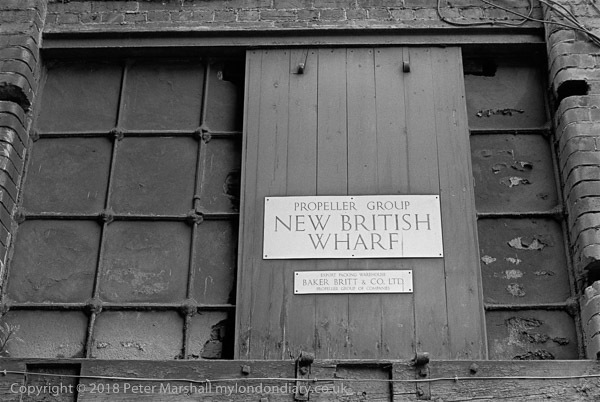 Hibernia (or New Hibernia) Wharf, immediately to the north of Southwark Cathedral was originally built in 1836, most was destroyed by fire in 1851, but the rebuilding was to the plans of William Cubitt. 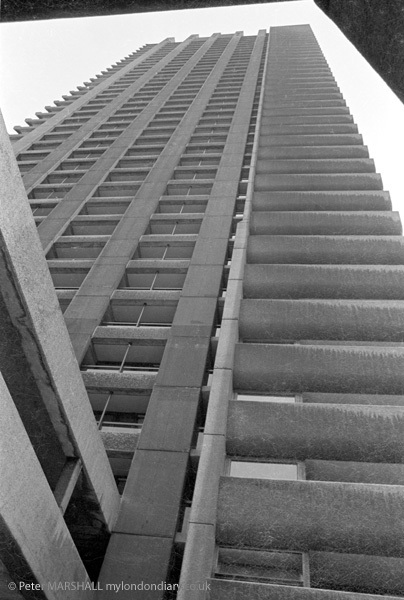 At the east end of the site on London Bridge and Montague Close you can see the facades of a part of this building but the interior was gutted in 1970 and interior walls replaced by concrete, though parts of the original undercroft were retained. 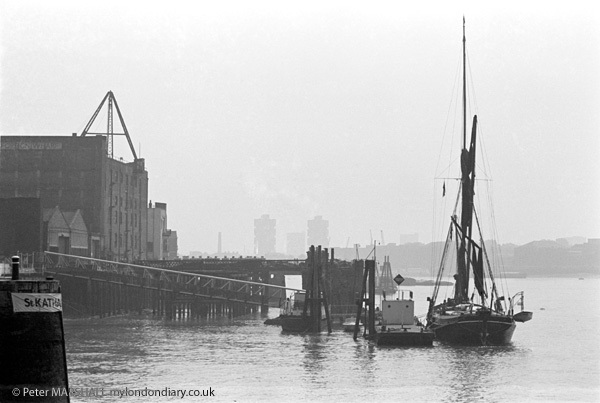 These wharves handled goods on a small scale, using hydraulic cranes and other machinery, and largely went out of use in the 1960s as bulk handling of cargoes, decasualisation of dock labour and containerisation moved the traffic to large docks downstream. 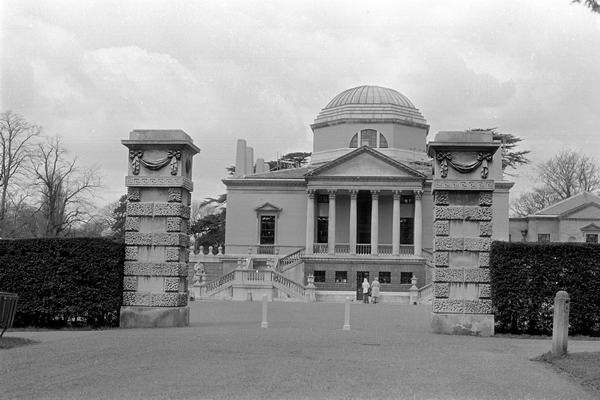 Some buildings continued to be in use for storage of goods until around 1980, but were demolished shortly after. Looking carefully at the picture again I think it may actually be looking west along Pickfords Lane, with the building on the right being Pickford’s Wharf, which had further buildings to the south across the lane. I think you can see a little of Winchester Palace and Clink St in the distance. 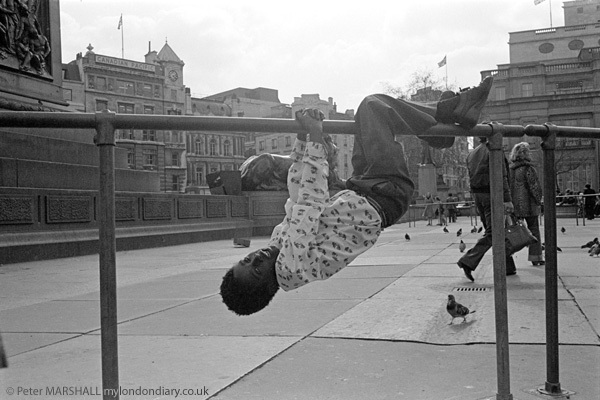 The first in a series of posts which will eventually include all of the selected photographs I took in London in 1978 and posted recently on Facebook with comments, and a few related images. All of these pictures (and more) are in my London Pictures web site, and eventually I intend to add the comments there too. 1978 was really the year I came of age as a photographer, having met and been challenged, inspired and encouraged by one of the UK’s greatest photographers and teachers through a series of workshops. 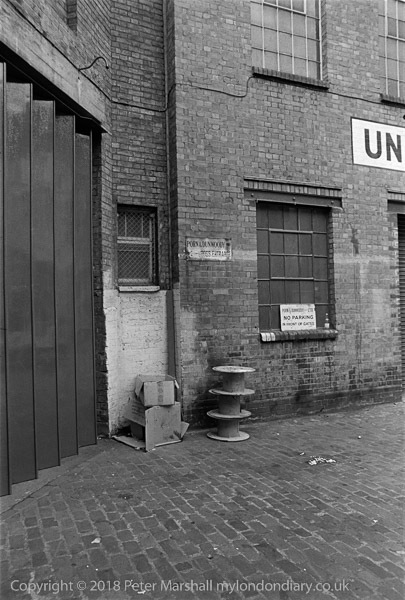 Raymond Moore made me think seriously about producing bodies of work that led to my projects on Hull and on London. I was still desperately short of time, working well over 60 hours a week during term-time in my teaching job (and even shorter of sleep after my second son was born.) 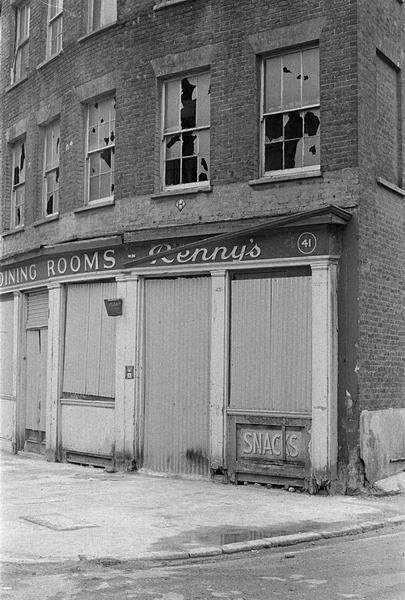 Among the first fruits of this were a series of images on the former docklands in Southwark, and this was one of the earliest images. 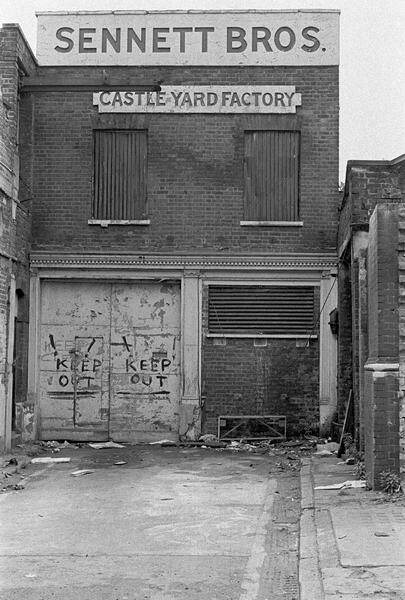 Sennett Brothers who had the Castle Yard Factory off Holland St were a reminder of some of the earlier industries of Southwark, Hatters, Furriers and Skin Merchants. 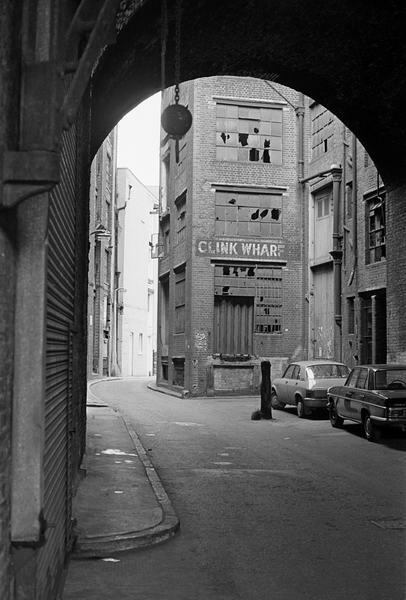 The official address of the company, liquidated in 1963 was in Hopton St. The street will have got its name from the engineers John Rennie the Elder and John Rennie the Younger who had their engineering works in nearby Holland St, but lived at 27 Stamford St, a few yards from where Rennie St crosses. They were the best-known civil engineers of their era, with the elder responsible for many canals and other great schemes, including many bridges. The old Waterloo Bridge was perhaps the best known by the father, while his son built London Bridge, which was sold in 1967 and some of its stones used to build a replica in Arizona. There was also Rennies Wharf nearby. Parker Horwell and Kirk Ltd were engravers, and the Southwark Borough Commercial & Industrial Guide gives their address as 14 Southwark Bridge Rd, SE1, where it bridges over Park St. There are now 2 large blocks on each side of Park St, Rose Court at 2 and City Gate House at 22, and nothing between. I think this building was on Park St with an entrance on Southwark Bridge Road, with the large OXO advert facing the main road. 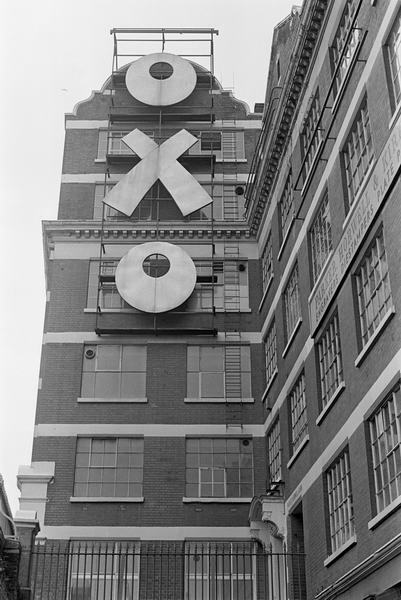 There is of course a far better known OXO advert around a kilometre to the east on the OXO Tower, built into the architecture of the Liebig’s Extract of Meat Company’s factory to get around a ban on advertising on the South Bank. Presumably there was no such ban away from the river. 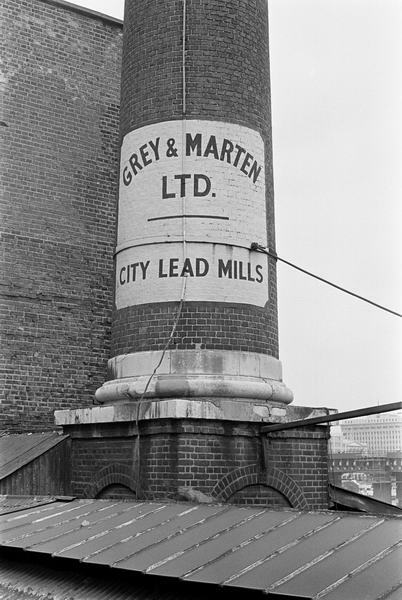 Just across the Southwark Bridge Rd from Parker Horwell and Kirk, where now the FT building stands were the City Lead Mills of Grey & Marten Ltd (my London’s Industrial Heritage site puts them on the wrong bridge) whose address was City Lead Works, Southwark Bridge, London, S.E1. To the right in the distance you can see Cannon St railway bridge and Adelaide House, on the north bank of the Thames next to London Bridge. 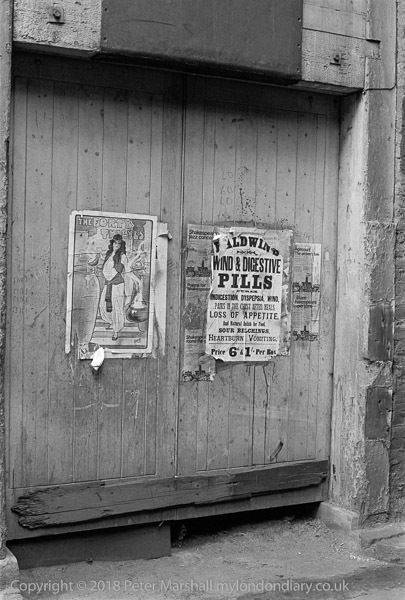 The company was established in 1863 and was apparently still in business in the 1960s and among other things sold leaded windows from an address in Little Park St as well as making lead containers and protective lead sheeting for medical X-ray and radioactive equipment. 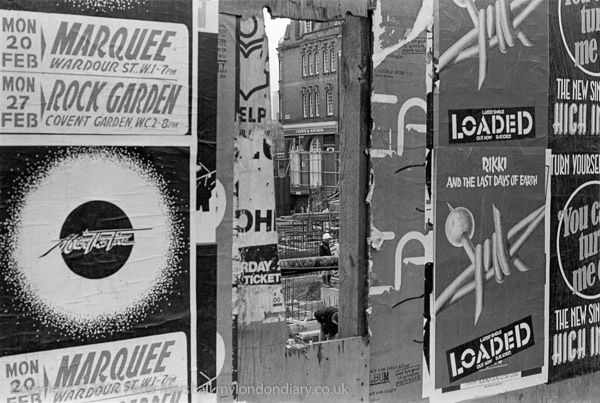 1976 was another lean year for my pictures of London, partly because I was still busy on house and garden. But there were other family reasons too, with my first son arriving within hours of my finishing work for the summer holiday in July. He began to make his presence felt as midnight approached, and an ambulance, blue lights flashing, sped us the couple of miles to the maternity unit at Ashford. But after a couple of hours they sent me home, deciding there would be nothing happening until the morning, and it was late the next day when I noticed some unusual activity on the monitor and called the nurse into the room and things really got moving. Soon I was banished as things started to get clinical, and a fainting husband would only have complicated matters. But before that we’d made a few trips, including a visit to Hull and a week in Amsterdam. 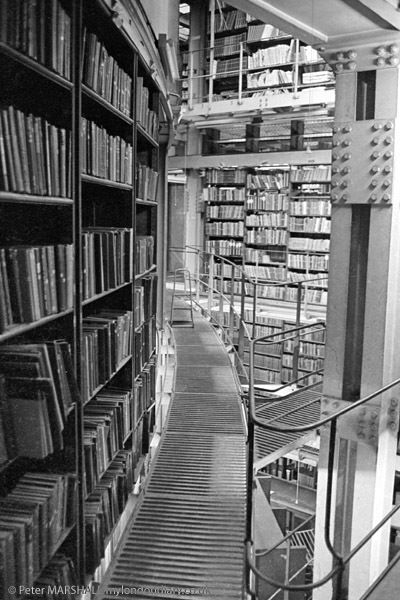 In London, one was on Linda’s last day working at the British Museum, and I went up at lunchtime for a quick tour of the place -including that famous Reading Room, still in use and sneaked a couple of pictures in there, and in the stacks where the books were kept. 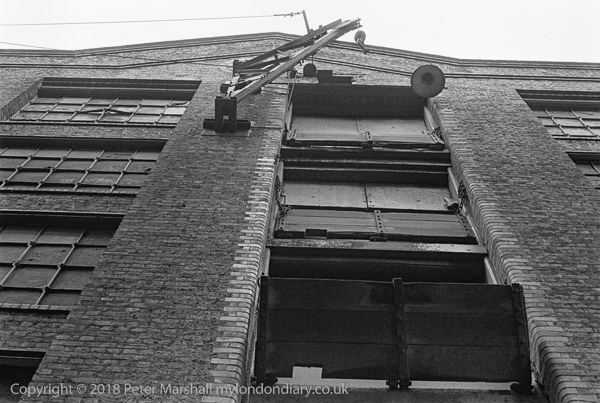 The 35mm f2.8 Minox was a nicely inconspicuous little camera, though the results were a little variable, even after I’d persuaded Leitz (it took some persistence and a trip to Luton) to swap my initial purchase for one with a properly assembled lens. I was doubtless in breach of the Official Secrets Act, but I think these can now be shown. Linda’s boss at the museum had invited us to go out to lunch, and we walked to a rather expensive Greek restaurant in Fitzrovia. The lunch was pleasant and we got through several bottles of wine too, before Linda and her boss had to go back to put in a token appearance at work. 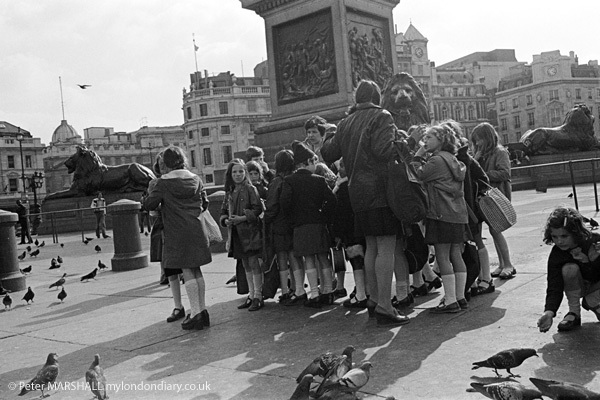 I strolled down to Trafalgar Square and spent half an hour or so taking candid pictures of the tourists with the Minox, which, with a few jokey captions and a bit of a story made a nice article in Amateur Photographer. Looking at the contact sheet, the wine certainly shows, with some very odd horizons, though there were some pictures where I was ‘shooting from the hip’ to work close and unseen to the subjects. Going to anywhere in London away from the centre or the tube was not so easy back in the 1970s, before the advent of the Travelcard. Even on the Tube things were trickier than now as tickets were simply from place A to place B (either single or return) and bus fares depended on how far you were going. Some journeys I might need to buy 3 or 4 separate tickets for, and it was hard to plan journeys. 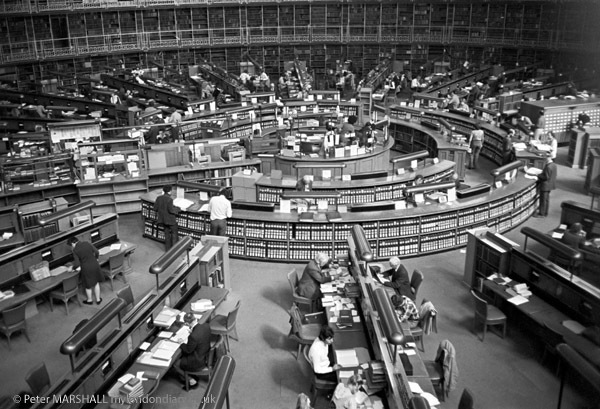 Bus, train and tube route plans or timetables were not widely available (although the tube plan was at least in street atlases) and there were no web sites on which to look things up. But about the only way to get any information about buses was to look on their route boards, ask the conductor or go along to the enquiries office at the bus garage. Piper’s Companion Guide to London has one of its longer sections on transport in London, much of it now rather like the misleading advice to tourists on ‘I’m sorry I haven’t a Clue’. Using a bike was one way round this, but again in some ways it was much harder. You could put a bike on some trains, but had to rush along the platform to find the guard and the luggage area where they were allowed – if there were space. We lived a little too far out of London for it to be easy to ride in, though one weekend we made our way from Staines to a green event in the Surrey Docks, at the Surrey Docks Farm which had started the previous year on a 1.5 acre site of derelict dockland between the entrance to Greenland Dock and the River Thames (it moved a short distance from there to a slightly larger site in 1986.) It was a ride of around 25 miles each way across South London. I think I took a total of 35 frames on the ride and at the farm, with one hopelessly underexposed. Film was still a rather expensive luxury for a young man with a large mortgage expecting soon to become a father. It was the hottest summer on record, and by the beginning of July we – and particularly a heavily pregnant Linda – were finding it rather a strain, so we didn’t get out a great deal. I had a day out looking at exhibitions in London, taking some rather random street photography, and we enjoyed a trip out to Chiswick House, but I took few pictures. And I’d found a new interest in Family Pictures. 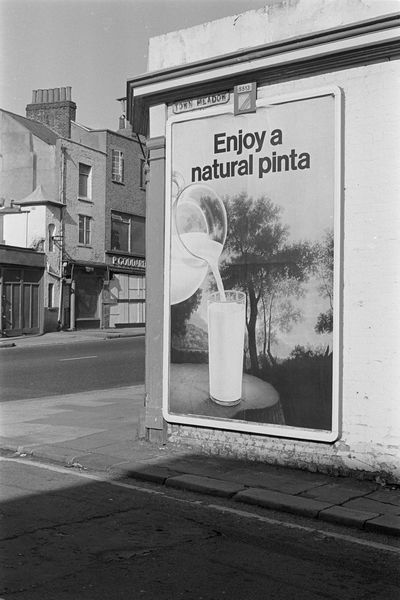 Although I kept reading David Piper’s Companion Guide to London (see My First London Pictures), it was a while before I got the chance to take another walk from it, not until the following year, 1975. Of course I was doing a demanding full-time job – around 70 hours a week with preparation and marking – as Head of Dept in a large (2000+ students) comprehensive, but I’d also bought a house that was almost a hundred years old and wasn’t in the best of condition. It had been condemned around 20 years earlier, but then they’d built on a bathroom extension (breeze block and asbestos) and given it a reprieve. And at some point it had gas put in, then rather later electricity. The gas light fittings had been pulled off, leaving bare pipes sticking out of the walls, and the electric didn’t include any light fittings on the first floor – the previous occupiers had relied on the street lamp outside. The decoration was interesting, with a few nastily ‘modern’ features imposed on top of the old. And of course back around 1880 there were no such thing as cavity walls, and the builders had dug a hole in the back garden for the sand, leaving some rather large stones in the render which made drilling holes in the wall interesting. I’ve never been a great fan of DIY, but spent most of the next year – when I wasn’t busy excavating the garden – stripping doors, putting battens, glass fibre and plasterboard on external walls, stripping off layer upon layer of wallpaper and then the rather nasty distemper underneath, painting or wallpapering etc. It put me off moving ever again, and we are still in the same house 38 years later. The garden was in an interesting condition too. Carefully planted with lots of border plants to attract buyers near the house twenty yards down it was a bed of nettles. A foot lower under them was a partly broken layer of concrete, a yard around which there had once been pig sties. It took rather a lot of clearing that sent me to the doctor with back problems. 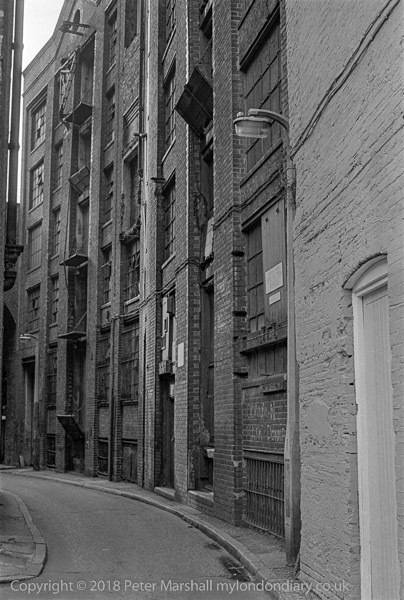 So my photo files for the next year or so are very thin, with most of the pictures being taken when I was away from home, as I made a start on the work that in 1983 became ‘Still Occupied – A View of Hull‘, and London got almost left out of the picture. Finally I did manage a few more of the walks from the book, around St Paul’s, Bank, the Barbican and Piccadilly Circus, but the pictures were nothing special. It was only when I took a brief walk to follow up from my pictures the previous year in Wapping that things began to get just a little more interesting. Piper’s book was a good introduction, full of sometimes interesting anecodote, and the walks in it helped to get me to see London, but as a photographer I needed something different. Perhaps a map of the Berlin Underground would have helped, but I didn’t have one, but what I really needed to do was to simply follow my own path, wandering where things looked interesting. Books – and the Piper was the first of what is now a large collection – were often useful after the event to tell me what some of the buildings I had photographed were, but were not going to tell me what was worth me photographing. Piper’s book is still worth reading, in part as a reminder of so much that has been lost. 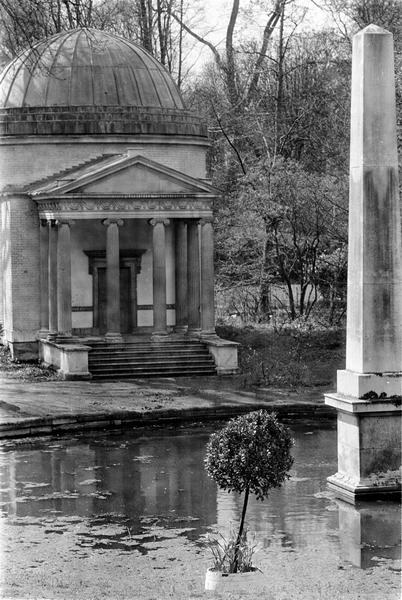 The photographs in it are generally workmanlike, but some have a little more to them, and I wasn’t surprised on turning to the credits to find quite a few by Edwin Smith and Eric de Maré, two of the better British photographers of the era in which it was written. I’ve written about both of them in the past, but those features are no longer available on-line.